The atmospheres evoked by the seasons of the year are the inspirations behind this month's show at the Spiral Gallery. "Four Seasons" features glass pieces by Phyllis Flury and jewelry by Jerilyn Walker. There will be a reception for the show from 6-8 p.m. Friday, Oct. 5, at the gallery at 341 Broadway St. The pieces in the show represent winter, spring, summer or fall. Flury describes the glass and jewelry as "a good accent to each other." Flury particularly enjoys creating fused glass pieces, a process that involves firing several layers of the material with ground up glass between them inside a kiln. Much of Flury's work features landscape scenes, and she often draws inspiration from photographs of the outdoors. She noted that an initial challenge when working on pieces for "Four Seasons" was showing the difference between spring and summer, but ultimately achieved this through the use of color. "Summer has more bright color and spring is a lot of pastels and greens," she said. Flury's favorite piece in the show is a coat rack with glass depictions of each season. The winter panel features a snowman; the spring panel consists of a green, pink and yellow landscape; the summer panel has bright flowers and the fall panel highlights autumn leaves. Similarly, nature is a frequent inspiration for Walker's jewelry. "I tend to have leaves as a signature piece. It's what people like," she said. She usually works with sheet metal or a combination of precious metal and clay to create necklaces, earrings and other pieces of jewelry. Walker noted that although it's difficult to pick a favorite piece in the show, one that stands out to her is a necklace that depicts Mount Hood. "I really wanted to get it to look like Mount Hood," she said. "I get excited when people walk up and say 'Look, it's Mount Hood.'" For Walker, the most rewarding part of being an artist is interacting with people. you've enjoyed making and their happy to take home, you've achieved what you've strived for. It's a finished cycle." 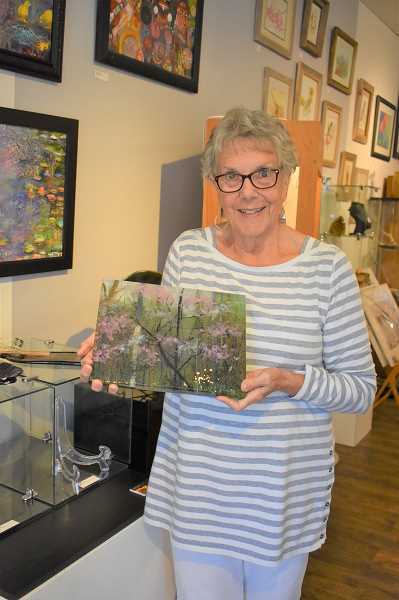 "Four Seasons" featuring glass work by Phyllis Flury and jewelry by Jerilyn Walker, will be featured at the Spiral Gallery through the end of October. There will be a reception from 6-8 p.m. Friday, Oct. 5. The gallery is at 341 S. Broadway St.